Research suggests that around 38 percent of employers allocate their highest levels of resources to poor performers and just 8 percent give much of their time to high performers. This means that it’s likely that most of you will have experienced the situation of a failing employee; that is, someone who is not meeting performance targets and who you are perhaps considering firing or placing on a serious performance improvement program. Of course we should not hold on to lost causes, but when we consider external hiring difficulties and replacement costs it could make sense to focus less on firing and to adopt a more progressive approach and actually rehire the employee. Sounds a bit off the wall, doesn’t it? Rehire not Fire. But, don’t me wrong, rehiring doesn’t mean holding on to mediocrity; it means recharging and rejuvenating employees, enabling them to continue with the verve and energy of a brand new hire, hence why it should be like a rehiring experience. 1. Finding out the cause of under-performance. There will always be a cause for the under-performance and more often that not it is treatable. The cause might be: unclear expectations, lack of training or knowledge, non work related issues, not suited to the job and that they are just disengaged. Or, it could be a combination of these things. Don’t skirt over this part. Take as many meetings as you need to establish what the exact causes of the issue are. 2. Drawing a line in the sand. This is one of the key elements of a rehiring not firing policy. While it’s crucial to rake over the old ground and leave no stone unturned, as in step one above, it’s vital that you draw a line in the sand at this point. However, the previous under-performance is not being forgotten, but it has been acknowledged, explained, demystified and now put aside. It’s important that there is an emphasis on looking forward so you demonstrate that there is a bright future for the employee at the company if he or she wants it, and that you are committed to working with the employee to achieve it. 3.Visualize a bright future using carrots as well as sticks. 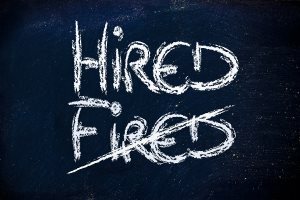 This is another crucial element of a rehiring not firing strategy. While there will need to be a period of performance improvement, the stick will only get you get you so far. It’s vital that you also offer a carrot, which is the hope of a brighter future beyond the performance improvement period. Don’t just leave that bit blank. Studies show that employees are most motivated by incentives and not penalties, and so it’s vital that a longer term brighter future is spelled out to the employee. This would mean setting goals, targets and suggesting more exciting responsibilities that can occur in the year following the improvement period. This might be: transferring to a more suitable role or department, modification of the role to include more desirable responsibilities, a promotion, additional training…anything which inspires employees. It’s important that this is seen to be conditional on the initial improvement and that it is credible, detailed and inspiring. Following these three principles when dealing with under-performance is one of the most effective methods to rehire and not fire under-performing employees.